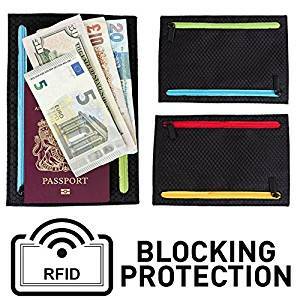 This lightweight travel organiser wallet has four colour coded pockets to help you organise your currencies, receipts and credit cards efficiently and safely. There is also an internal security pocket for storing Passport and Boarding Cards. Peace of Mind when Travelling in High Risk Public Areas like Airports, malls and public transportation. Our Secure RFID Blocking material will protect your credit cards from identity theft. Secure internal passport pocket to keep your passport safe and secure.